(CNN) -- Mine That Bird produced a huge shock as he streaked to victory in the 135th running of the Kentucky Derby at Churchill Downs. 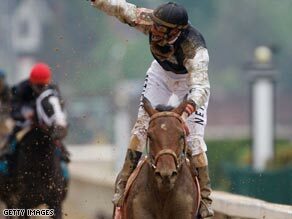 Mine That Bird comes home alone to claim a shock victory in the Kentucky Derby. Trained by Bennie Woolley and ridden by Calvin Borel, the outsider shot through a gap on the rails in the home straight, putting the race to bed in a matter of strides. The well-fancied Pioneerof The Nile looked perfectly poised rounding the home turn but had no answer as the winner shot clear. Musket Man was third for Irish-born trainer Derek Ryan. Borel gave his mount -- available at 139-1 on Betfair as the gates opened -- a superb ride as he claimed his second Derby after Street Sense two years ago, coming from a mile back and slicing through the field. It also completed a memorable two days for the jockey, after he also won the Kentucky Oaks in spectacular style on Rachel Alexandra. Borel told reporters: "It's unbelievable. It's been a long road but it's paying off. He's done it for me today. I took him back and rode a Street Sense race. I got up the fence the whole way, had a good trip -- I got stopped once but after that he was awesome. "I knew if I could find my way through he was going to do it. When I kept asking he kept getting closer. I got a gap and he went in there. I was a fair way back early, 20 lengths. I knew I had a lot of horse."